Reflected in the lake, the Victoria Monument Victoria Monument and museum. 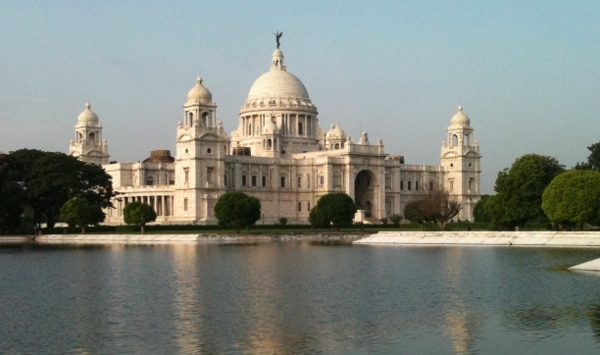 Last December I paid a visit to the Victoria Memorial with my friends. This tribute to Queen Victoria was a wonder that I thought our readers might want to share in. The creation of Sir William Emerson, is a sight to behold for sure. The grounds being a sanctuary no visitor to Kolkata should miss. 25 hectares of lush greenery, etched with walking paths here and there, surround this wonder of the British East India Company legacy. Sir William was, after all, the President of the British Institute of Architects back then. The foundations of white marble for this wonder were actually laid down as early as 1906, but the design of the structure represents an amazing fusion of British and Mughal architecture. The site now serves as not only a tribute to Victoria, empress of India, but as a museum for all to enjoy the treasures of the past. Inaugurated in 1921, this massive building measures 338 by 228 feet, and stands over 180 feet tall. Rare and interesting works of art and unusual items lines the hall and its walls. Set in the middle of the gardens I mentioned, the place actually serves many residents and visitors as a “day trip” outing spot – great for picnics and leisurely walks. When you come to visit, make sure you don’t miss the Light and Sound Event that is held daily. Known as the Son-et-Lumiere, it portrays the British East India Company’s coming to Kolkata, and the evolution of the city until Independence. The museum is ope from March to October at 10 AM, and closes at 5 PM. From November to February, the museum is open until 4 PM, but the light show begins at 7:15 promptly. Admission is INR 10.00 for Indians, and INR 15.00 for foreigners. Photography inside the museum is strictly prohibited.